Benitoite: Mineral information, data and localities. 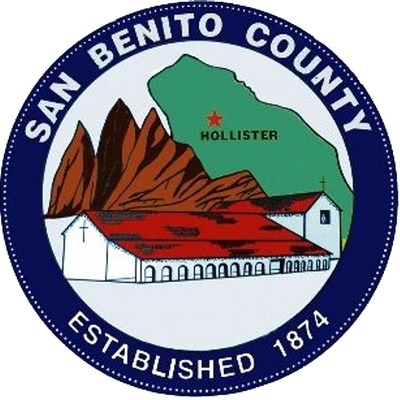 After the type locality, "as it occurs near the head waters of the San Benito River in San Benito County", California, USA. 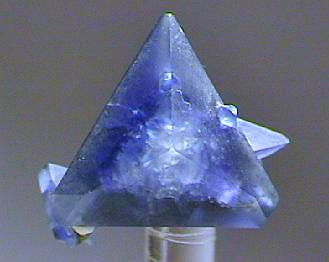 Benitoite Group. The titanium analogue of Pabstite. Visit gemdat.org for gemological information about Benitoite. 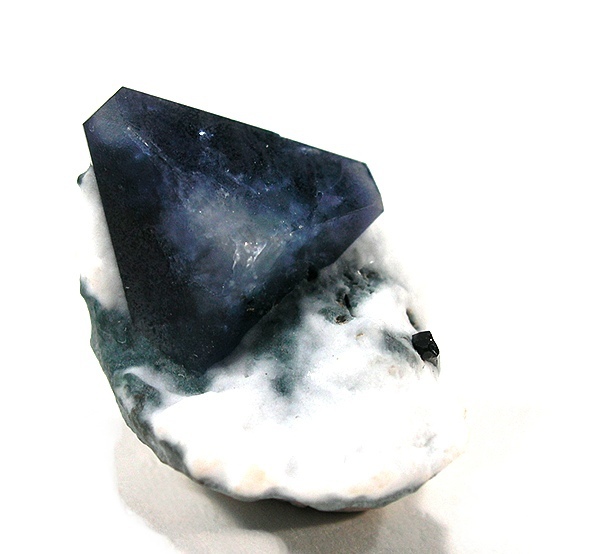 Louderback, G.D. and W.C. Blasdale (1907) Benitoite, a new California gem mineral, with chemical analysis by Walter C. Blasdale, University of California, Department of Geological Science Bull. : 5: 149-153. Neptunite 327 photos of Benitoite associated with Neptunite on mindat.org. Natrolite 256 photos of Benitoite associated with Natrolite on mindat.org. Joaquinite-(Ce) 120 photos of Benitoite associated with Joaquinite-(Ce) on mindat.org. Crossite 46 photos of Benitoite associated with Crossite on mindat.org. Joaquinite Group 13 photos of Benitoite associated with Joaquinite Group on mindat.org. Albite 11 photos of Benitoite associated with Albite on mindat.org. Djurleite 9 photos of Benitoite associated with Djurleite on mindat.org. Glaucophane 5 photos of Benitoite associated with Glaucophane on mindat.org. Serandite 3 photos of Benitoite associated with Serandite on mindat.org. Bario-orthojoaquinite 2 photos of Benitoite associated with Bario-orthojoaquinite on mindat.org. 9.CA.15 Catapleiite Na2Zr(Si3O9) · 2H2O Mon. Invariably fluorescent blue in SW UV. Kraus, E.H. (1908) Interpretation of the chemical composition of the mineral benitoite. Science, new series: 7: 710-711. Louderback, G.D. & W.C. Blasdale (1908) Benitoite, its mineralogy, paragenesis, and geological occurrence (abstract). Science, new series: 27: 411. Blasdale, W.C. (1908) Chemical formula of the mineral benitoite: Science, new series: 28: 233-234. Hlawatsch, C. (1909) Bemerkungen, von über die Krystallklasse des Benitoit: Tschermak's Mitt., Band 28, pp. 178-181, 1909…(abstract): Zeitschr. Kristallographic, Band 50, p. 617, 1912. Hlawatsch, C. (1909) Die Kristalform des Benitoit: Centralbl. Mineralogie, 1909, pp. 293-302, 410. Hlawatsch, C. (1909) Bemerkungen über den Benitoit: Zeitschr. Kristallographic, Band 46, p. 602, 1909. Louderback, G.D. & W.C. Blasdale (1909) Benitoite, its paragenesis and mode of occurrence, University of California, Department of Geologic Science Bulletin: 5: 331-380. 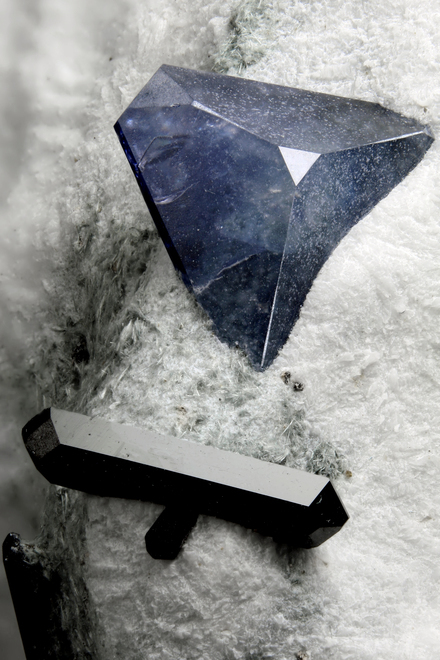 Palache, Charles (1909) Note on a crystal form of benitoite. American Journal of Science, 4th. series: 27: 398; …(abstract): Zeitschr. Kristallographie, Band 46: 379. Louderback, G. D. (1910) Benitoite, its Paragenesis and Mode of Occurrence. University of California Pub. 5, 331. Valeton, J.J.P. (1927) Über die Struktur des Benitoits: Fortschr. Mineralogie, Band 12: 91-92. Fischer, K. (1969) Verfeinerung der Kristallstructur von Benitoite: Zeits. Krist. : 129: 222-243. Neues Jahrbuch für Mineralogie, Monatshefte (1987): 16-30. Gaft, M., Nagli, L., Waychunas, G., and Weiss, D. (2004) The nature of blue luminescence from natural benitoite BaTiSi3O9. Physics and Chemistry of Minerals: 31: 365-373. The following Benitoite specimens are currently listed for sale on minfind.com. Nishio-Hamane, D., Ogoshi, Y., & Minakawa, T. (2012). Miyahisaite, (Sr, Ca) 2Ba3 (PO4) 3F, a new mineral of the hedyphane group in the apatite supergroup from the Shimoharai mine, Oita Prefecture, Japan. Journal of Mineralogical and Petrological Sciences, 107(3), 121-126; Ohe Rikosha specimen. Ohe Rikosha specimens, and collector labels. ; http://www.issp.u-tokyo.ac.jp/labs/mdcl/lab/denken/wordpress/?page_id=1969#a02; photo in: Koubutsu Doshikai (2017) Kanto-to Shuhen-no Koubutsu (279pp). Barwood, H (1995), Benitoite and Joaquinite in Arkansas, Min.News: 11(5):2, 5. [MinRec 33:161]; Canadian Mineralogist (2001): 39:1053-1058. Alfors, J.T., M.C. Stinson, R.A. Matthews & A. Pabst (1965), Seven new barium minerals from eastern Fresno County, California: American Mineralogist: 50: 319; Pemberton, H. Earl (1983), Minerals of California; Van Nostrand Reinholt Press: 466. Reed, Ralph Daniel & J.P. Bailey (1927), Subsurface correlation by means of heavy minerals: American Association of Petroleum Geologists Bulletin: 11: 363; Murdoch, Joseph & Robert W. Webb (1966), Minerals of California, Centennial Volume (1866-1966): California Division Mines & Geology Bulletin 189: 288; Pemberton, H. Earl (1983), Minerals of California: 466, 484. Reed, Ralph Daniel & J.P. Bailey (1927), Subsurface correlation by means of heavy minerals: American Association of Petroleum Geologists Bulletin: 11: 363; Murdoch, Joseph & Robert W. Webb (1966), Minerals of California, Centennial Volume (1866-1966): California Division Mines & Geology Bulletin 189: 102. William S. Wise (1982) Strontiojoaquinite and bario-orthojoaquinite: two new members of the joaquinite group . American Mineralogist 67:809-816. Pabst, Adolf (1978) Zur morphologie des taramellits. Tschermaks Mineralogische und Petrographische Mitteilungen: 25: 245-256; Pemberton, H. Earl (1983), Minerals of California; Van Nostrand Reinholt Press: 465-466, 467; American Mineralogist (1984): 69: 358-373; Joseph F. Cooper Jr., Gail E. Dunning, Ted A.Hadley (2003) Minerology of the Victor Claim, Clear Creek Area, New Idria District, San Benito County, California. Louderback, George Davis & Walter C. Blasdale (1909), Benitoite, its mineralogy, paragenesis and mode of occurrence: University of California, Department of Geological Sciences Bulletin: 5: 331; Louderback, George Davis & Walter C. Blasdale (1907), Benitoite, a new California gem mineral, with chemical analysis by Walter C. Blasdale: University of California, Department of Geological Sciences Bulletin: 5: 149-153; Murdoch, Joseph & Robert W. Webb (1966), Minerals of California, Centennial Volume (1866-1966): California Division Mines & Geology Bulletin 189: 102; Pemberton, H. Earl (1983), Minerals of California; Van Nostrand Reinholt Press: 372, 466; Wise, W.S & Gill, R.H. (1977): Minerals of the Benitoite Gem mine. Mineralogical Record 8, 442-452.